A new Lard Lad is ready to set in town but someone is not that happy about it. Meet someone we haven’t seen yet on tv in the preview for the new Season 28 premiere! 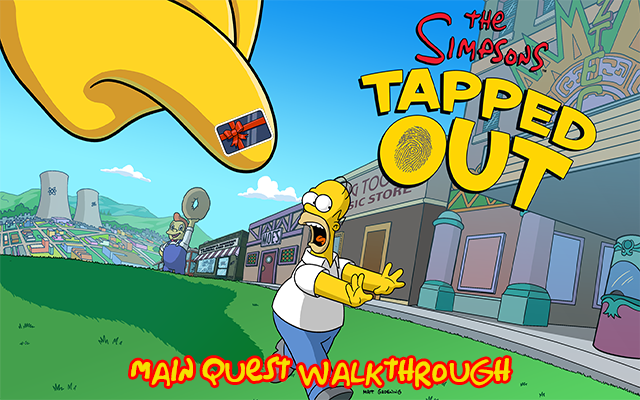 Join us right after the jump for the walkthrough of the main quest of the Monty Burns’ Fleeing Circus tie-in! After logging in, the tie-in autostarts, requiring Homer immediatly. Homer: Ah, the coffee break: the sweet spot between beer breakfast and lager lunch. Lenny: If you’re looking for donuts, forget about it. Burns is on another health kick: all we got is Kombucha and kale. Homer: No donuts?! This isn’t like health insurance, you can’t just take it away! Marge: You left work and came all the way home just for donuts?! Homer: Some men climb mountains, some explore the oceans depths; I brave traffic in search of the elusive baker’s dozen of delicacies! Marge: Oh, for the love of… Just go buy some from the Lard Lad. 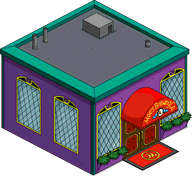 Marge: It’s a donut store! Homer: Really?! No wonder the pink tread on my car tires wore right off. From part 2 onward, you’ll be able to collect Gift Cards to unlock the prizes by sending characters to jobs. Homer: Have I travelled back to a time before giant boys walked the earth?! 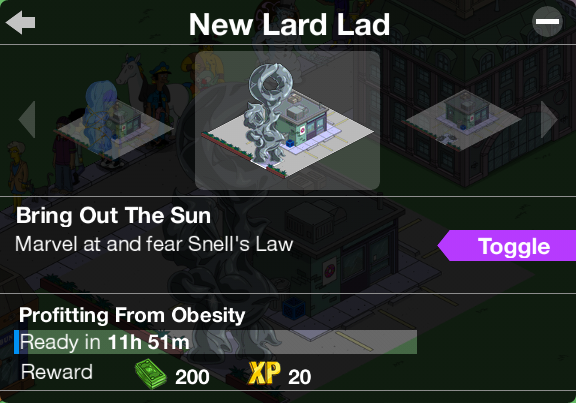 Where’s the Lard Lad statue? Robert Chan: Relax, folks. I’m Robert Chan, CEO of Tianjin Mining and Smelting and Donuts. I’m here with the flesh-and-blood Lard Lad to announce that we’re sunsetting his likeness and rebranding with something fresh and modern. Moe: Makeup on the old mug ain’t a bad idea. Maybe I’ll do some re-Moe-deling. Youse corporate suits always got good ideas up your sleeves. Moe: Someday I’ll have sleeves. Robert Chan: To commemorate the unveiling of our new icon, we’ve partnered with local businesses to offer gift cards, redeemable at all Lard Lad locations. Moe: As a reviled member of the local business community… I’ll pass. Homer: Since I’m flush with gift cards, this Prince of Plastic demands four dozen of your finest donuts, please. Squeaky Voice Teen: Sorry sir, all these are only good for one donut. Our prices went up to reflect the ostentatious image of our new brand. Homer: What the EpiPen?! A business charging more for the same product? Quimby: Maybe I should glitz up the Quimby image. A little flash might help detract from all my ‘er, many broken promises. Homer: If rap culture and the Catholic church have taught us anything, it’s that nothing says “classy” like solid gold everything. 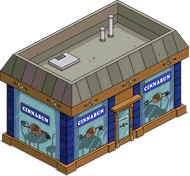 Homer: Apu, a dozen donuts, stat! Insert directly into this patient’s donut hole. 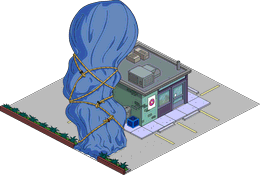 Apu: Sorry, Mister Homer, but the health inspector was coming, so I donated my old donuts to the food bank. Homer: Awwww! The needy get all the breaks! Homer: Moe, I normally look to you to get fried but now I need that “fried” to be donuts. Moe: Sorry, all I got is a pickled egg with the yolk missin’. Damn rats love my yolks! Homer: Let the rats have their yolks. I’ll find my own donuts. 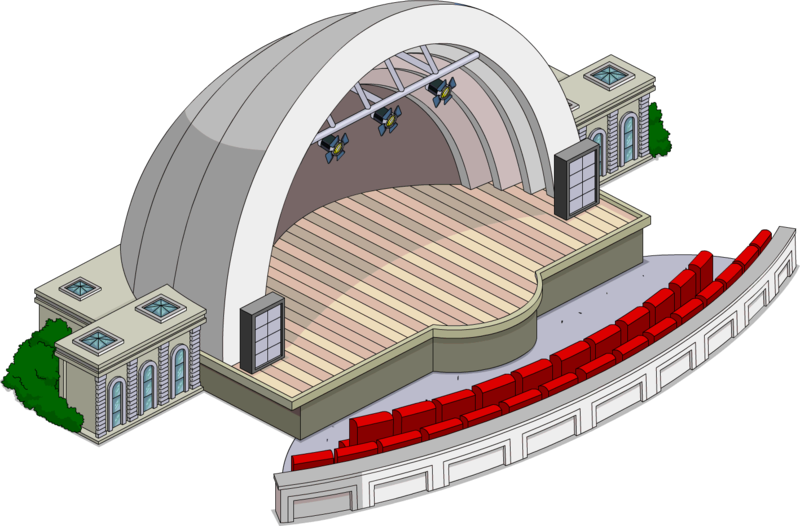 Homer: Here donut-donut-donut! Come out, come out, wherever you are! 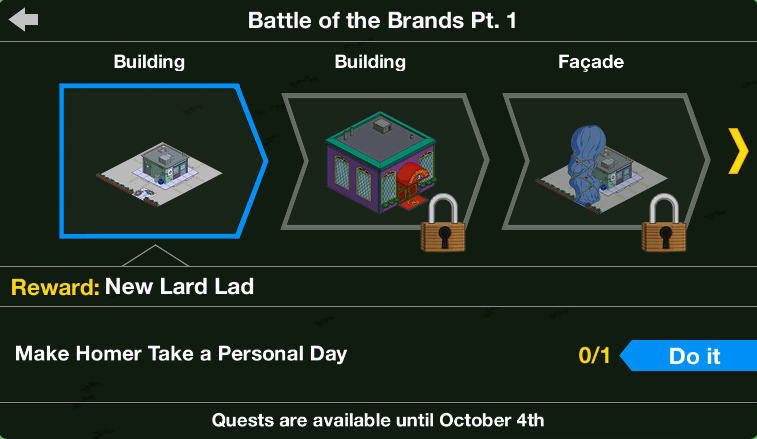 System Message: Tune in to FOX on Sunday 8/7c for the Season Premiere, before unveiling the brand new Lard Lad in the final chapters. The final 2 parts of the main quest can be completed only from Sunday September 26th at 1am BST, right when the episode starts airing, comprising of spoilers from the episode itself. Lenny: These new donuts are great! There’s “fresh rebranded” flavor in every bite. Carl: They’re snackable, munchable, swallowable and a bunch of other “ables” that I’ll make up later! Homer: Damn my voracious donut envy! Gimme one! Squeaky Voice Teen: Sorry sir, the price has gone up again. Just like college tuition, if something is more expensive, it makes people want it more. Homer: As a Springfield College grad, I say that’s stupid! Now gimme-gimme!! After the building changes skin, the building is caught on fire thanks to the metallic surface. The fire can be toggled now in the menu by tapping on the building. Laird Ladd: You tore down my image for this?! Someone tell me where the face is on this thing so I can spit in it! Lisa: It’s like a Salvador Dali sculpture gone horribly wrong. 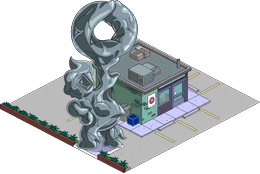 Homer: The statue may be a melted mess but these new donuts are great. I can feel the dark donut-less cloud lifting from over my head. Lisa: That’s the actual clouds, Dad. Look, the sun is coming out. 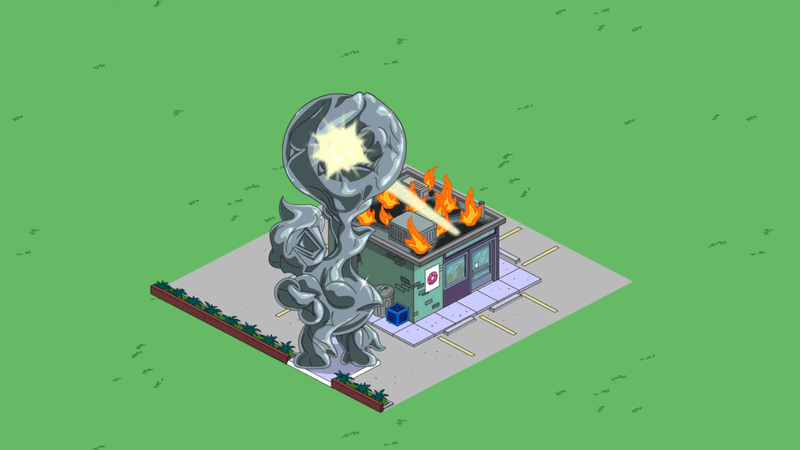 Sideshow Mel: The Cronenbergian monstrosity has become a thermodynamic weapon! Professor Frink: Snell’s bells! Refraction claims another victim, with the focused light and the BURNing! Robert Chan: Well, this was a bust. At least we managed to drum up business with all the hype. Squeaky Voice Teen: Actually sir, we haven’t made a single cent. Everyone’s been paying with the free gift cards. Robert Chan: Recall those cards before Tianjin Mining and Smelting and Donuts stock plummets and we’re bought out! Join us next time for more info on this tie-in, happy tapping! Previous EA Forum is back!